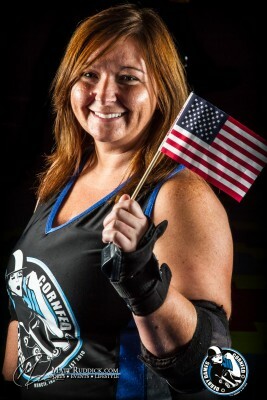 The Cornfed Derby Dames will conclude their seventh season at home on Saturday, July 8 at Gibson’s Skating Arena, 2610 S. Mock Ave. Cornfed will host the Brewcity Bruisers of Milwaukee, Wisconsin in a double header versus their A and B teams. 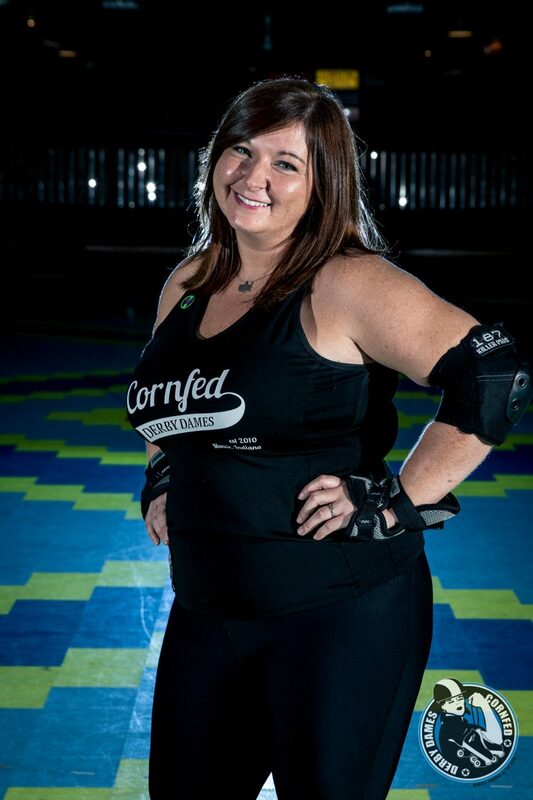 The Cornfed All-Stars will open the bout at 6 p.m. followed by the Muncie Missfits at approximately 8 p.m. 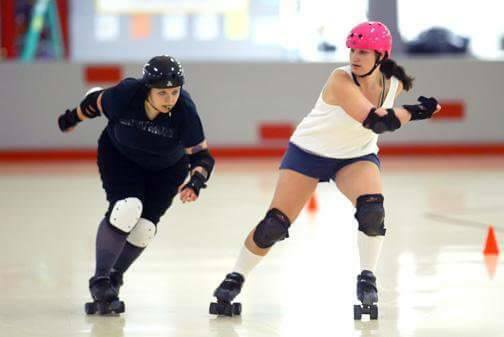 The theme of the bout will be “Throwback Throwdown” which will celebrate the eras that each of the skaters were born in. Skaters and attendees both are encouraged to come dressed in the popular style of the year they were born. 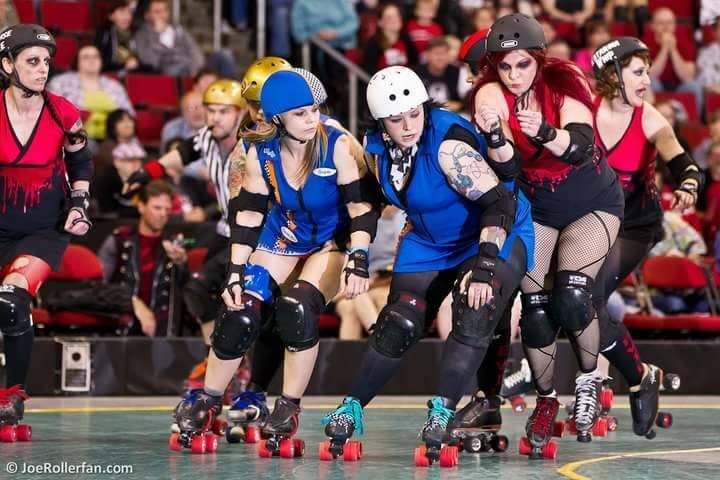 Doors open at 5 p.m. with tickets costing $12 per person the day of the game or $10 in advance through Brown Paper Tickets or from any Cornfed Derby Dame. College students are just $8 with an ID and children ages 10 and younger are free with the purchase of an adult ticket (limit two children). Snacks and non-alcoholic beverages are available at the concession stand. A portion of all bout proceeds in 2017 will be donated to Muncie OUTreach. Cornfed will host a New Skater Clinic during their off-season this fall. Keep an eye on cornfeddd.com for more information. 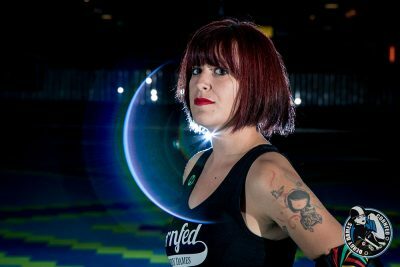 The Cornfed Derby Dames suffered two hard losses against Ann Arbor Roller Derby’s Arbor Bruising Co. and Ypsilanti Vigilantes on Sunday, March 12. The team is looking to change their fate at their next home game on Sunday, April 2. 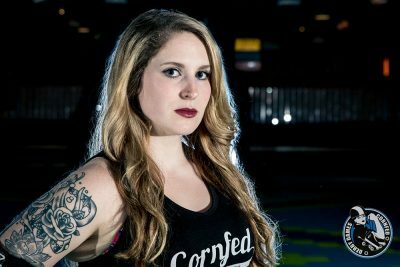 Cornfed will hold its third home game of the season on Sunday, April 2 at Gibson’s Skating Arena, 2610 S. Mock Ave. 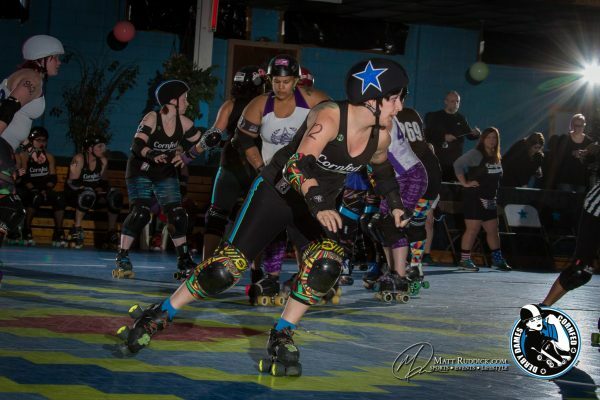 The team will host Gem City Roller Derby of Dayton, OH and A-Town Roller Derby of Anderson, IN for a double header. 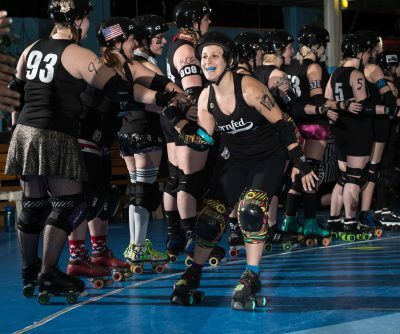 Doors will open at 1 p.m. with a 2 p.m. start time for the Cornfed All-Stars vs. Gem City’s Purple Reign followed by the Muncie Missfits vs. A-Town Roller Derby at approximately 4 p.m.
One additional home date will take place on Saturday, July 8. Cornfed will travel to Dayton, OH on April 22, Indianapolis, IN on June 3, Cincinnati, OH on June 10, Cleveland, OH on June 24, and Quincy, IL on July 22. The Muncie Missfits will also participate in the “B-Cup Tournament” May 20 & 21 in Bloomington, IN. U.S. Amee (left) and Breckin U. 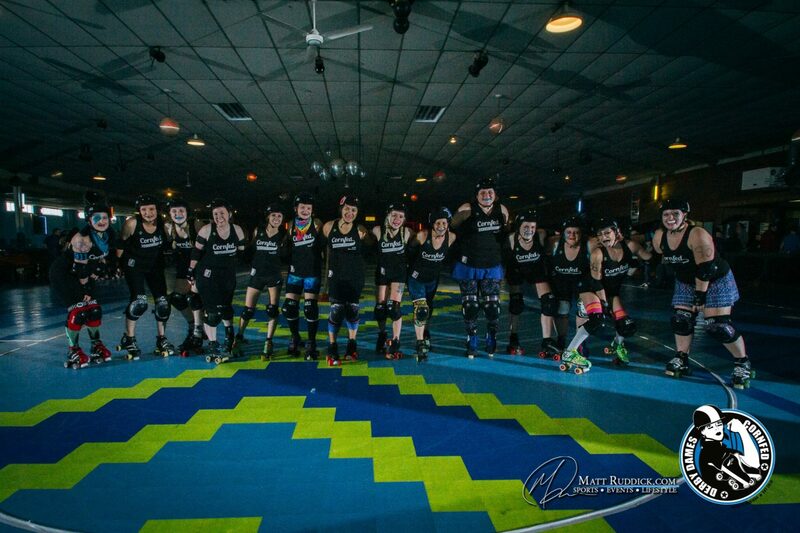 Down (right) prepare for a bout at the start of Cornfed’s 4th Season. 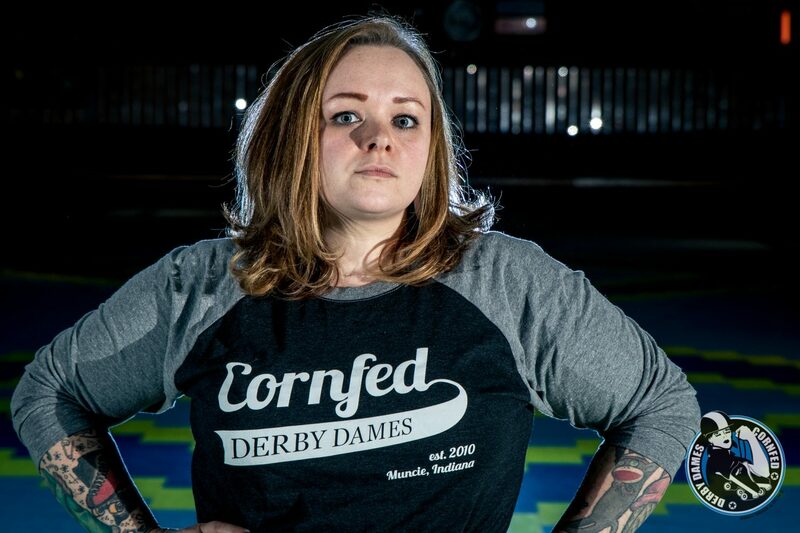 If you just discovered the Cornfed Derby Dames, you might not know that last year was the inaugural season for the Muncie Missfits, Cornfed’s B Team. 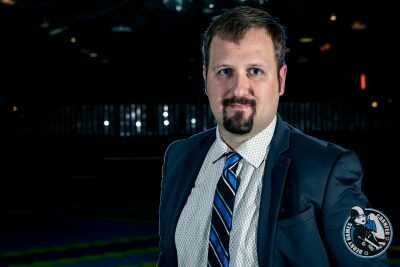 The increasing number of active skaters in the league and the addition of a second team has brought the need for an expanded coaching staff specifically focused on training and nurturing the Missfits. 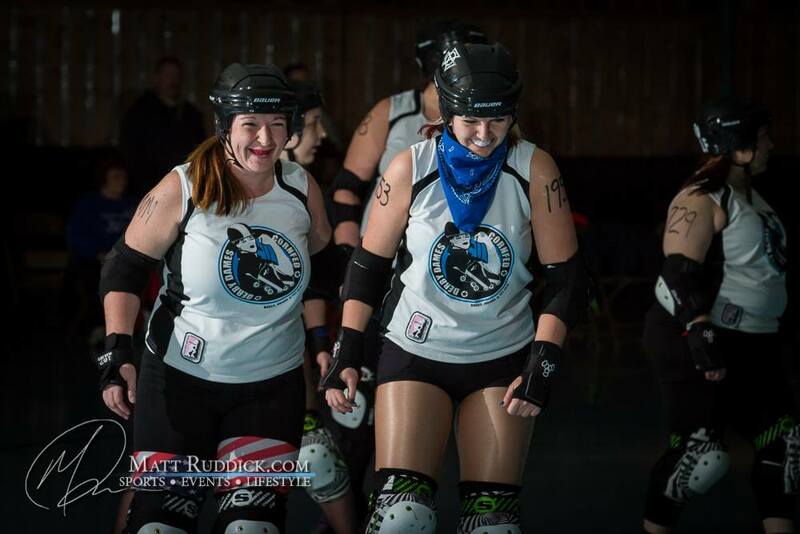 Two Cornfed veterans stepped up to the line this season to take on new roles as coaches for the Missfits. U.S. Amee serves as the Missfits’ Co-Head Coach with Emily Daly and Breckin U. Down serves as the Bench Coach. This is the first time either Amee or Breckin have taken on a coaching role, but both have been integral parts of Cornfed for many years, making them great resources to the Missfits. Get to know Amee and Breckin just a bit more by reading about their history with the sport and their motivations and inspirations as newly appointed coaches. How long have you been playing Derby? How did you get involved? AMEE: I started Season 3, so this is my 5th season! I was introduced to derby by a friend who went to Naptown bouts. I went with her and fell in love! I finally got the nerve to play myself when I was asked by Leia Mout if I thought about playing! I was so nervous to go outside my comfort zone, but I had grown up at Gibson’s Skating rink and loved being on my skates, so I thought…why not? BRECKIN: Since CFDD day 1. Spring 2010. One of the founders told me they were starting a team in Muncie. I had been watching Naptown for a couple years. What motivated you to decide to try your hand at coaching? AMEE: I want to share the knowledge I have with all the babies! If I can help mold a player in anyway, that is my way of giving back to the sport and to all the many people who have taught me this awesome sport! I want nothing more than for all the B babes to have the most confidence in themselves! They are all capable of amazing things! BRECKIN: As a captain for the MissFits last year, I really enjoyed the energy of new skaters and helping teach them the rules and the skills. I saw Bench Coach this season as a way to further help them become the future of Cornfed. What do you see as the biggest challenge in coaching versus playing? AMEE: Well, this season I am coaching the B team and playing on the A team all at once. I think this will be the biggest challenge. I want to improve myself and make a great contribution to the A team, but at the same time, I want to be able to give the Misfits 100%! They deserve nothing less! BRECKIN: I think learning each skater’s strengths and weaknesses. Then to pair them with the best possible pack to provide what we need on the track at that time. What are you looking forward to the most this season with CFDD? AMEE: I am looking forward to so many things! I can’t wait to see how our rankings go up this season! We have set some goals that I can’t wait to see achieved! Also, I love watching people improve and get better, and push each other to the max! BRECKIN: To see how high the All-Stars can get in our ranking. And to watch the MissFits find their rhythm and shine. There are a bunch of new faces. I can’t wait for the fans to see what they can do. Where do you go to get inspiration to bring to CFDD players? 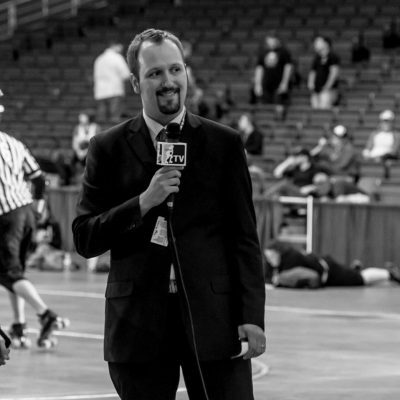 AMEE: I spend a lot of time watching higher-level teams–our idols! The more derby we all watch the more we can bring to the team! BRECKIN: I go to practice. We are our best motivators and support system. We all want to be successful and we drive each other to it. Anything else you’d like to share with CFDD Fans? BRECKIN: The All-Stars are looking better than ever. The future All-Stars taking the track as MissFits are working hard to learn the ropes. You do not want to miss Lucky Season 7! 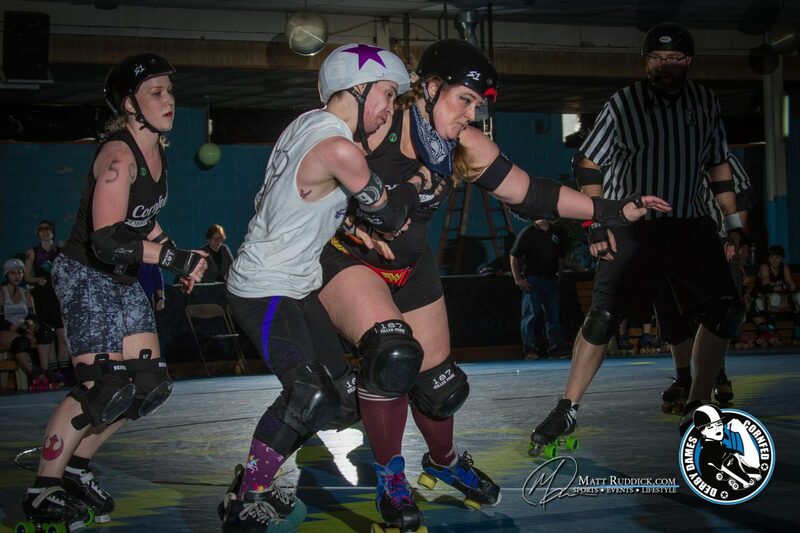 See these two in action as All-Stars skaters and Missfits coaches on Sunday, March 12 as Cornfed takes on Ann Arbor Roller Derby’s Arbor Bruising Co. and the Ypsilanti Vigilantes. Tickets are available online for $10 here, or $12 on game day at the door. 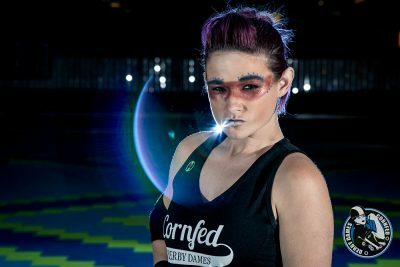 The Cornfed Derby Dames kicked off their seventh season with two very close games against the Derby City Rollergirls of Louisville, Kentucky on Sunday, February 26. The Cornfed All-Stars skated away with an eight-point victory with the Muncie Missfits taking a narrow loss by 12 points. Cornfed will hold its second home game of the season on Sunday, March 12 at Gibson’s Skating Arena, 2610 S. Mock Ave. 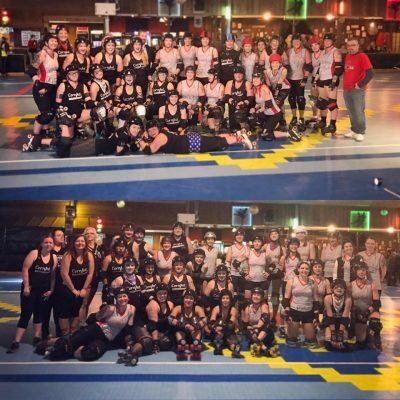 The team will host Ann Arbor Roller Derby’s B and C teams for a double header. 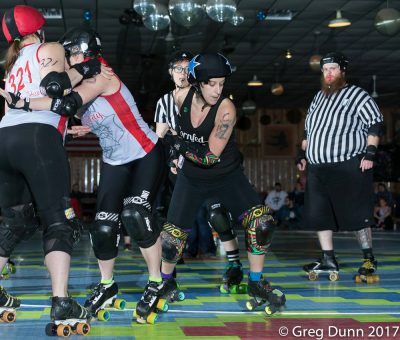 Doors will open at 1 p.m. with a 2 p.m. start time for the Muncie Missfits vs. the Ypsilanti Vigilantes followed by the Cornfed All-Stars vs. Arbor Bruising Co. at approximately 4 p.m.
Two additional home dates will take place on Sunday, April 2 and Saturday, July 8. Cornfed will travel to Dayton, OH on April 22, Indianapolis, IN on June 3, Cincinnati, OH on June 10, Cleveland, OH on June 24, and Quincy, IL on July 22. The Muncie Missfits will also participate in the “B-Cup Tournament” May 20 & 21 in Bloomington, IN. Due to the high costs of travel and lodging, the dames are accepting donations from fans online here.